The April edition of MOG is out now. Featuring the launch of the stunning new, yet retro looking, BMW straight 6 engined Morgan Plus Six. Also unveiled at Geneva was the limited edition Plus 4 110 Works edition. 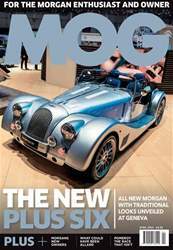 We report on new investment at Morgan Motor Company, the first major change in 110 years of family ownership. For those readers missing big V8 engines we tell the story of how Allard introduced big American engines into British cars, and there is a little known story concerning Peter Morgan and Concorde. All this and so much more, including what our regular contributors have been up to in their Mogs.